Successfully Added 360 Degree 4K Action Camera - 30M Waterproof, 220 Degree Fish Eye Lens, 16MP, FHD 2448P At 30FPS, Wi-Fi, HDMI (Black) to your Shopping Cart. 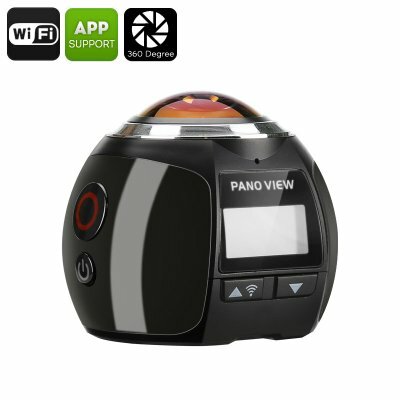 Take awesome panoramic footage with the 360 degree panoramic 4K action camera that is 30m waterproof, comes with Wi-Fi and HDMI. If you’ve already had your share of fun with action shots, it may be time to take things a step further. The 360 degree action camera will let you do just that - take amazing panoramic footage of your outdoor adventures in stunning 4K quality. Put you sports camera in the centre of the action and capture great shots. With Wi-Fi support, you will be able to instantly share your footage - let the world know what you are up to in almost real time! You can also save your photos and videos on an SD card or hook up the camera right to the big screen via HDMI. Thanks to H.264 encoding, the cam will store your footage efficiently without compromising its quality. With a micro USB, you can also connect the am directly to your laptop or PC - it’s compatible with Windows XP/7/8/Vista and Mac 10.5 or above. The 1200mAh battery gives up to 1.5 hours of shooting time. The action cam comes with a waterproof case that will allow you to take the camera as deep as 30 meters down. With a set of brackets, adhesive and mounts that come with, you will have everything you need to capture great footage right out of the box!